The Trump administration is expected to unveil the new 5 Year Offshore Oil Drilling Plan as early as this week, after signing an executive order earlier this year to expand offshore oil drilling in U.S. waters. 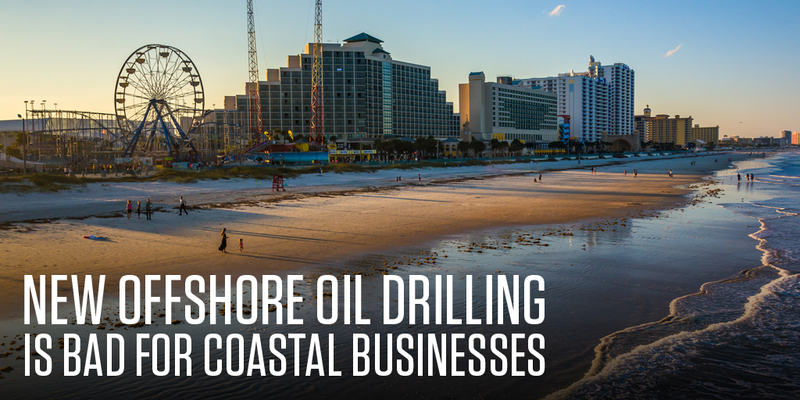 Expanded offshore oil drilling threatens recreation, tourism, fishing and other coastal industries, which provide over 1.4 million jobs and $95 billion GDP along the Atlantic coast alone. The executive order directed the Interior Department to develop a new five-year oil and gas leasing program to consider new areas for offshore drilling. The order also blocked the creation of new national marine sanctuaries and orders a review of all existing sanctuaries and marine monuments designated or expanded in the past ten years. New offshore drilling would threaten thousands of miles of coastline and billions in GDP, for a relatively small amount of oil. Ocean tourism and recreation, worth an estimated $100 billion annually nationwide, provides 12 times the amount of jobs to the U.S. economy, compared to offshore production. Even under the best-case scenario, America’s offshore oil reserves in the Atlantic and Pacific would provide only about 758 days, or 25 months supply of oil at our current rate of consumption, according to federal agency estimates. Join the Ocean Recreation Hill Day February 15-16, 2018 and find out more here. Participate in Hands Across the Sand on May 19th to demonstrate grassroots opposition to new oil and gas development click here.